Mental Health is essential to an individual’s well-being, interpersonal relationships, and the ability to live a full and productive life. Unfortunately, the burden of mental illness in the United States is among the highest of all diseases. 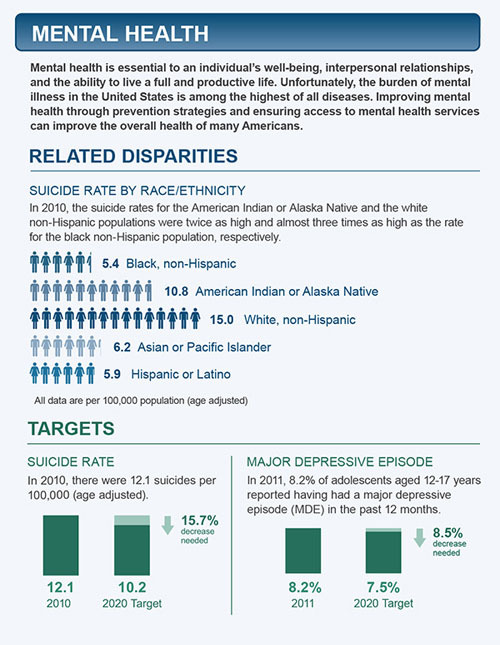 Improving mental health through prevention strategies and ensuring access to mental health services can improve the overall health of many Americans. In 2010, there were 12.1 suicides per 100,000 (age adjusted). In 2011, 8.2% of adolescents aged 12–17 years reported having had a major depressive episode (MDE) in the past 12 months.